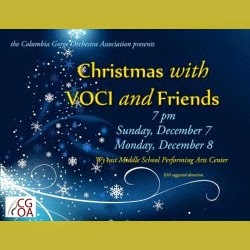 Christmas with VOCI and Friends is coming to Wy'east Middle School in Hood River this December. Performances with be on held Sunday, December 7th at 7:00 pm and Monday, December 8th at 8:30 pm. Although attendance is free, a donation of $10 is recommended. The Columbia Gorge Orchestra Association is presenting this performance of Christmas with VOCI and Friends, read more details of who to expect below. The Columbia Gorge Orchestra Association presents the Voci Choir, Gorge Brass Ensemble, Vocal Quartet and more for two evenings of beautiful seasonal music by such composers as Ola Gjeilo, Morten Lauridsen, Stephen Paulus, Gustav Holst, and more!